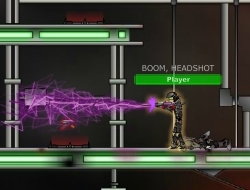 In this action game you will play a human that is in the heat of combat. Your goal is to complete the training mission and then head on and defeat all the aliens. Make good use of the weapons you will collect along the way and it will make your kills a lot easier. Some areas of the map will alter your jump height so make sure you learn how to move well across the tough terrains. Also take cover when you will be reloading so the enemies will not get a clear shot at you. Have fun shooting all those opponents and be the one to survive this whole war. Use WASD to move and the mouse to aim and fire. Press Q and E to change weapons. Raze 0.00 between 0 and 10 based on 0 votes.